Coila’s inaugural recording. 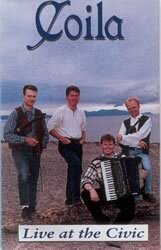 A limited edition of this album was released in 1994 comprising of one of Coila’s annual performances at the Civic Theatre in Ayr. For all ceilidh fans, this recording is a must. I thoroughly enjoyed the mix of music and instruments which had the audience clamouring for more at this live recording. It is well balanced and I think will go down particularly well. Congratulations to ‘Coila’ for recording it live in front of a large audience. I’m sure it must have been a daunting task and I wish them every success with this, their debut recording.